SuperSeal Brick-M is a water based Silicone Water Repellent made of a special hybrid of Silane and Siloxane. 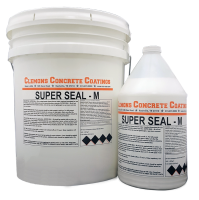 SuperSeal-M provides water repellency to porous construction material such as bricks, stone, concrete blocks, mortar, and grout. It is not suitable for very low-porosity substrates such as polished stone. It will not leave a sheen or "wet" look. The active ingredients in SuperSeal-M Water Repellent Sealer are a mixture of different-size particles, some larger, some smaller to fill different size voids. This ensures good penetration into porous substrates, resulting in good coverage and durable water repellency. Additionally, the active ingredients in SuperSeal-M Water Repellent can chemically react with the substrate, ensuring long-lasting performance. Water Beads up fast on substrates treated with SuperSeal-M Water Repellent Sealer. The product's excellent water repellent and fast beading action are immediately apparent. What you will not see is any change in the substrates appearance. It can be applied to "Green" concrete once bleed water is gone. Prevent Spalling from salt and freeze/thaw damage. Fast beading action-excellent water repellency. Non-SiH: Easy to store and handle. Low VOC-Supports your regulatory compliance efforts. Water Based-Easy to use and clean up. Will not add a slippery film.